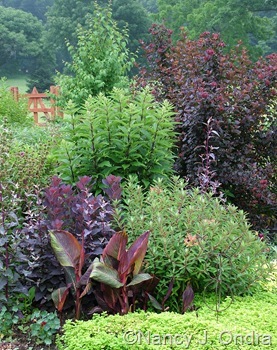 Purple foliage lends itself so well to high-contrast plant pairings that it seems almost a waste to try it in quieter combinations. In my garden, this usually happens only by accident: The purple foliage is there waiting for the bright flowers to do their thing, and it ends up looking good with another leafy partner. Well, I’m inclined to enjoy beauty where I find it, and these unplanned pleasures often delight me more than my carefully considered pairings. Above is a little vignette of ‘Husker Red’ foxglove penstemon (Penstemon digitalis) next to Trifolium rubens (an ornamental clover), with some Japanese blood grass (Imperata cylindrica ‘Rubra’) at the bottom. In this image, the penstemon is a week or two away from flowering, after which it loses most of the purple in the leaves, but this little corner is quite pretty until then. Below is a somewhat longer-lasting combination in the same bed, of ‘Velvet Cloak’ smokebush (Cotinus coggygria) underplanted with ‘Iron Cross’ oxalis (Oxalis tetraphylla). 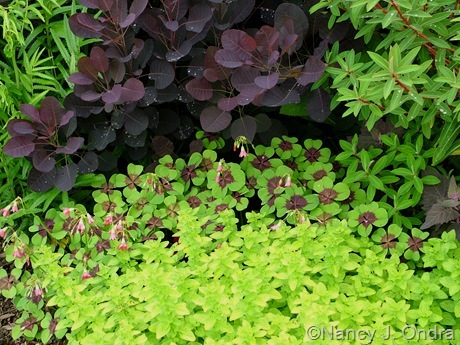 It’s shown here in late June of 2007, just before the rosy pink flowers of the oxalis really got going, and while the new growth of the cut-back smokebush was in its richest color. Once the smokebush shoots elongated, the scene wasn’t quite as tidy and color-rich, but by then, showier combinations were firing around it to steal the show. Below is a wider shot of that bed, also taken in late June but two years earlier. I had a canna in place of the oxalis, but overall, the effect is still pretty much one of quiet anticipation; the scene is set but the stars aren’t yet on stage. Still, the varying forms, textures, and colors add interest of their own. I particularly like how the dark stems of the self-sown Joe-Pye weed (Eupatoriadelphus maculatus) echo the similarly dark smokebush, the Tropicanna canna (Canna ‘Phaison’), and the Diabolo ninebark (Physocarpus opulifolius ‘Monlo’). 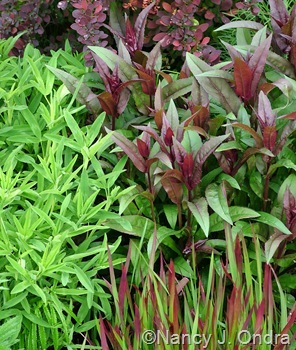 Purple-mottled foliage is as good as purple stems for creating color echoes in combinations. 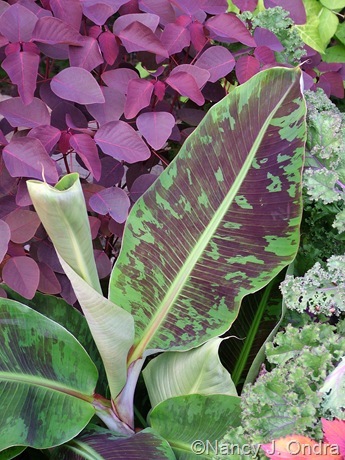 I actually can take credit for the pairing below, but not much credit, because it was so obvious at planting time that the Euphorbia cotinifolia and the banana (Musa zebrina) would look great together. 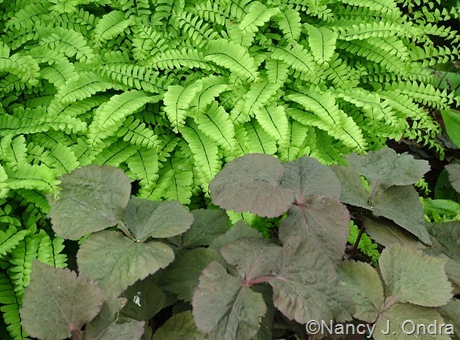 For those of you with some shade, below is an elegant example of echoing dark stems with dark foliage, from my friend Nadeen’s garden: maidenhair fern (Adiantum pedatum) with Cryptotaenia japonica ‘Purpurea’. I could definitely see ‘Obsidian’ heuchera, with its even darker leaves, as a superb substitute for the cryptotaenia. 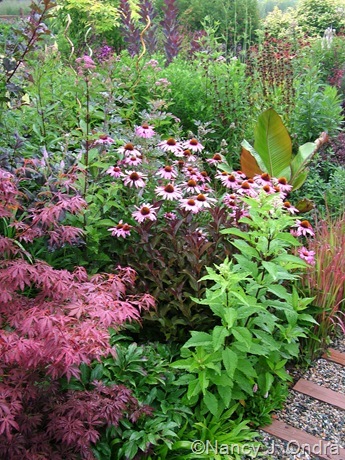 Pinks and pinkish purples are colors I often have trouble working with in the garden. Hot pink isn’t so much of a problem, but the rosy pinks and pastel pinks usually look dreadful with my favorite reds, yellows, and oranges. Silvers and blues would be better companions, but those soft combinations bleach out in my strong sun. So once again, purple comes to the rescue. Above is a simple July pairing of drumstick chives (Allium sphaerocephalon) with ‘Grace’ smokebush. It’s a pretty quiet combination, but not too precious, I think. A darker smokebush, such as ‘Velvet Cloak’, would be a zippier partner than ‘Grace’, who is pretty pinky herself by midsummer. 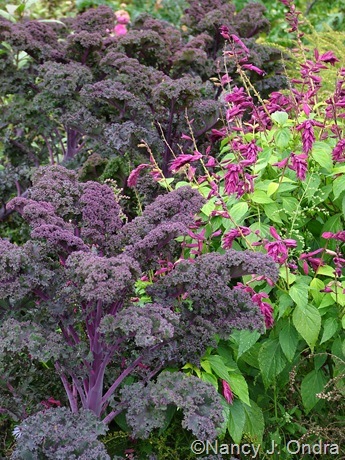 Below is a late October grouping of ‘Redbor’ kale with Salvia ‘Paul’, another odd purple I had trouble finding other companions for. And below is a clump of purple coneflower (Echinacea purpurea) in what was supposed to be my purple-and-red bed out front. I hadn’t at all intended for pink to sneak in there, but once the Joe-Pye weed had seeded in and filled the center so well, there was nothing for it but to give in and add more pink. At least the dark centers of the coneflowers do a nice job echoing the Midnight Wine weigela (Weigela florida ‘Elvera’) and some of the other dark-leaved plants. Ok, I think I’ve about beaten purple into the ground (so to speak). I wonder if I have enough time to trot out some of my yellow-theme pictures before this month’s Design Workshop is over…. Stunning pictures. I too love to follow the themes you have so beautifully spoken about. Your blog is inspiring today. Thank you. I read every word and even copied some plants I’d like to try. Thanks so much, Anna! I’m so excited for you, having a new garden to try out all kinds of combinations in! So beautiful, all your plant combinations. I put so little thought into how the plants look together, more how the whole garden looks as I see it from afar, does it need tall, flowers, color, a rock? Do you cut your smoke tree down every year, coppice is the term, I think? Thanks, Frances. I think it’s fascinating how some people are so good at big-picture stuff and others are more comfortable dealing with details. And then there are those with the gift of balancing both. I suspect I concentrate on creating little vignettes because my distance vision is so poor; unless there’s a lot of contrast, larger plantings are harder for me to appreciate. Whatever the reason, I’m glad we’re all different! Yes, I do cut both ‘Velvet Cloak’ and ‘Grace’ back hard every spring, to about 1 foot. Some people cal that coppicing; stooling is another term. I found that the combinations you featured today spoke to me on an emotional level more than the higher contrast ones you’ve shown earlier. I have a lot of fun finding plants to place by my purple smokebush, too, and I particularly like that combination with the iron cross. And did that Joe Pye weed sow itself from your meadow? I’m glad you shared that, Kathy. I wonder if it’s because these combinations look a bit more natural, whie the higher-contrast ones are more obviously contrived? Actually, I didn’t have any Joe-Pye in my meadow until I put it there. The clump shown came from (I assume) a very large clump of ‘Carin’ growing right across the path from this bed. Love the combination! It will last that much longer than flowers and has such great textures! ‘Husker Red’ is best in foliage don’t you think? Thanks, Layanee! 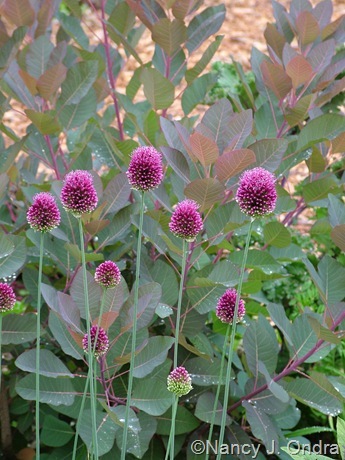 I do like it best when its leaves are reddish purple; the dark seedheads are pretty too, but subtle. I planted Japanese blood grass last year, you have given me some great ideas for companion plants. I’ve really enjoyed your purple series. Thanks, Robin! I love that grass too. For the sake of being politically correct, though, I should mention that the species Imperata cylindrica (cogon grass) is a terribly invasive plant in some regions. Some authorities consider ‘Rubra’ a concern too; others don’t. My plants have never flowered, so I don’t think they’re a concern for those of us in the North. But if anyone wants to know more, they could check out the PCA-APWG’s fact sheet, or the Imperata entry at Floridata. I also have enjoyed your purple series. While I delight in the high contrast stuff, I also really like pinks with dark purple. They just seem made for each other. I have Penstemon ‘Husker’s Red’ & am not thrilled with its color in my garden. I’m thinking of trying the new dark leaved Penstemon from the University of Nebraska, whose name eludes me at the moment. I’ve seen pictures of ‘Mystica’ From Benary Seed, though I’m not sure if that’s the one you’re thinking of. It looks great, but since it’s grown from seed rather than vegetatively propagated, I wonder if it too will eventually vary as much as ‘Husker Red’. Thanks for the rest of these purple combo suggestions Nan. I’m happy to see how many interesting purples there are available. So many yet to try!! I want to grow some different Salvias this summer. That coneflower combination turned out to be a pretty mix. There were a few plants in my garden last year whose color combos made me cringe so I’ll be moving a few around in the spring. These weren’t planned combos…just stuck in where there was a space, without actually thinking much about the color! Oh, yes…that “unplanned” thing can work both ways, just as the planned combos can. But wouldn’t it be boring if everything turned out just as we envisioned? We’d have to find another hobby!